We all know Rajasthan is the land of royal palaces, majestic forts and ancient temples. Hence, you can find all these beauties in each and every district of this beautiful state. However, only a few of them are frequented by tourists from all over the state and the country. A lot of them remain unexplored throughout the year. One such place which is only popular amongst locals is Bundi. Despite harbouring fancy palaces, monumental buildings and soothing sites, it is rarely visited by tourists from other cities and states. How about getting yourself to this ancient marvel this weekend and savouring its gorgeous places? On account of its location in the close proximity of Jaipur, it makes for a perfect weekend getaway. So, plan a trip from Jaipur to Bundi now to relish the hidden beauty of Rajasthan. Read on to know more about how to reach Bundi and its tourist destinations. Bundi experiences an extreme type of climate and hence, the summers are hot here. However, due to the presence of the hills and lakes, it maintains a bearable climate, even during the summer season. If you are looking forward to avoiding the summer heat of Rajasthan, then the best time to visit Bundi is from October until the end of February. By Air: As the nearest airport from Bundi is located in Jaipur, there is no option of reaching Bundi by air, if you are starting your journey at Jaipur. By Rail: Bundi has a well-connected railway station and hence, you can catch a direct train from Jaipur railway station to Bundi Junction. It will take you an approximate time of 3 h to reach your destination by rail. By Road: On account of good road connectivity, Bundi is easily accessible by road. You can either hire a direct cab or catch a bus to Bundi from Jaipur. Once you are on your way, you can take a break at Chaksu and explore its beautiful tourist spots which include historical sites and ancient temples. Chaksu is located at a distance of about 41 km from Jaipur and 175 km from Bundi and is mainly popular amongst locals and seasonal tourists for temples and other religious sites. Therefore, it is also sometimes referred to as the temple town. The major places to explore here include Sheetla Mata Mandir, Barkhera Jain Temple, Shree Ram Dham and Manohara Talab. You also get to savour the beauty of raw culture of Rajasthan here. So, do not forget to take a break in this beautiful town which has a lot to offer its visitors. Bundi is located at a distance of about 220 km from Jaipur and is also known as Little Varanasi on account of the presence of several age-old temples within its boundaries. It is also the place where Nobel Prize-winning author Rudyard Kipling was inspired to start his novel, Kim. Bundi is surrounded by the hills of the Aravalli Range and hence, provides its visitors with commendable landscape views. The history of Bundi dates back to the early Medieval Period of India when it was inhabited by local tribes and was under the control of Hindu rulers. Today, Bundi has become a tourist destination for those who look forward to exploring the history of India and the culture of Rajasthan. Following are the major places which you must visit on your trip to this ancient town. Also known as Star Fort, the beautiful Taragarh Fort is located atop a hill and overlooks the settlement of Bundi. It was built in the late 14th century and is a popular tourist spot in the town. On an average, it is visited by more than 10,000 tourists every year. The fort is mainly famous for its three tanks which never get dried up. Such is the advanced construction of this ancient marvel, that most of it still stands strong today. How about getting yourself to this wonderful beauty? It will certainly be objectionable if you are in and around the historic town of Bundi and do not visit Bundi Palace. Located beside Taragarh Fort on the slopes of surrounding hills, it is known for its ornate walls, ceilings and pillars which are adorned with enthralling murals and frescoes. The major attraction in the palace is Chitrashala, which is a picture gallery showcasing mesmerising paintings and frames. Therefore, it attracts history lovers as well as painters. 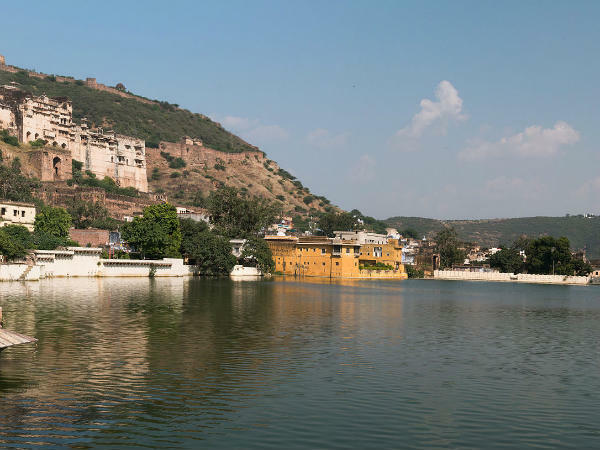 If you are done with exploring the historical beauty of Bundi and are looking for a place where you can just sit down and relax, then it is certainly Naval Sagar Lake, an artificial lake built in the shape of a square. You can also capture the beauty of a small temple in the middle of the lake which is dedicated to Lord Varuna, the god of water. So, what do you think about lazing by this soothing spot and getting lost in its pristine and charming atmosphere? Yes, Sukh Mahal is the place where the famous author Rudyard Kipling got inspired to pen down the critically acclaimed novel, Kim. It is a beautiful palace on the bank of Naval Sagar Lake and is a perfect spot to just chill and relax. If you are not satisfied with the above-given sites and are looking for more to satisfy your wanderlust, then you can also visit Chaurasi Khambon Ki Chhatri, Raniji Ki Baori, Sagar Bazar, Chogan Pol and Bardha Dam.